For round two V-Moda has knocked it out of the park with the Crossfade II Wireless. They're infinitely more comfortable than the originals, and while they still deliver strong bass they sound profile is better balanced, more accessible and even Hi-Res Audio certified if high-resolution is your thing (the lack of aptX HD is amiss for wireless, this being the case, however). Products in their "Mark II" rendition tend to just throw a new lick of paint at the original in the hope that you'll want to buy. Not so the V-Moda Crossfade II Wireless over-ear Bluetooth headphones: these bass-prominent cans have undergone a total rework for a more balanced listen with increased comfort and a visually better design too. Having used them for a number of weeks we've become slightly addicted to their wide-ranging sound, overall comfort and reliable bass delivery - putting them in the bracket of best headphones we've used this year. However, with a price hike compared to the original model and still no active noise-cancellation on offer, are the Crossfade II Wireless worth dropping your cash on? The biggest problem with the original Crossfade Wireless was their snug fit: vice-like, they weren't ideal for long periods of wear (despite softening up after many weeks sat over the head). The Crossfade II are remarkably different in this respect: they feel perfect to wear straight out of the box, without too much weigh overhead. Part of this is down to the Crossfade Wireless II's new design: the earcups are larger, sat tighter within the metal frame than the original model, which sees the comfortable sponge cups ensconce the earlobes perfectly. That soft finish is juxtaposed wonderfully by a metal design aesthetic that doesn't negate its industrial-styled identity. Exposed external screws, cut-away "v" shapes in the metal plates which flank the outer side of the earcups, and a foldable metal arms to hold everything together. These very well-made headphones indeed, you can tell just by looking, but it's a whole other thing to handle them. We have the black finish on loan for review, but the more adventurous may wish to choose stainless steel, polished or matte bronze instead. Or, if you're really plucky (read that as rich) then a bespoke sterling silver, 14K gold/rose gold/white gold, or platinum finish can be arranged to order, including three-dimensional commissioned works of art to protrude from the metal. There's a Micro-USB charging port to the base of the left earcup (not USB-C for some reason), the position of which is mirrored on the right by a 3.5mm headphones jack - which, if you want to use these cans wirelessly, is accented with an orange non-tangle cable (which, again, is industrial tough - we put it through the washing machine by accident and it's still good as new). Sure makes the Crossfade 2 look striking, without being overstated. Unlike the originals, the Mark II come with a folding design and included hard carry case. It's been handy for popping into a bag on our travels to ensure the metal doesn't get scratched, but even when we've forgotten the subtle rubbing to the edges is barely noticeable. The case is the best place for these cans to rest, however, as we don't find them that comfortable sat around the neck at all. In one of those rare headphone design moments there's very little we would change about the Crossfade II Wireless' design. Other than that massive logo up top: we'd cut that, especially as V-Moda offers a customisation service which allows for printing your own content; let the creatives line-up and leave the massive logos on the box please. With the original Crossfade Wireless we made no bones that they were strictly for bassheads. That's still true for the follow-up model, but the second-gen are far broader in their reach. Sure, there's bass aplenty, but the mids and high-end feel freer across the wide soundstage, capable of delivering quality for all kinds of musical genres. These are no one-trick pony. Part of that will be down to the Crossfade II being aimed at higher-end listeners, with Hi-Res Audio certification (approved by the Japan Audio Society (JAS)) meaning ultra-high frequencies above 40kHz are also catered for. However, there's no aptX HD, while aptX is reserved for the rose gold finish only - so wireless listening doesn't guarantee audiophile quality levels in all situations, which seems at odds with intention. But just because it's not ticking the audiophile box doesn't mean the Crossfade II Wireless don't sound good. Quite the contrary: they sound exquisite. The bass delivery from these cans is epic, with approaching sub-bass levels tickling the ears (no surprising given the 5Hz low-end frequency coverage). Volume-wise there's plenty on offer as standard, with only the Bluetooth connection being a little more limited - which is standard for headphones of any kind, really, given region-based regulation. This has led us to more often then not using them wired, but we could say the same of the Bang & Olufsen H8 and many others. The wireless connection - activated by dragging a switch on the right earcup into position - has remained strong throughout our testing and the battery life has delivered on its promise of 14-hours of listening. Even at high volume levels we've managed two full working days with the cans wrapped around our ears. The only downside are the default irksome "V-Moda noises" used for connectivity searching/confirmation, which is a standard overly loud sound that we don't really appreciate in any of the company's products, given its lack of subtlety. There's no active noise-cancellation in these cans, which although a shame doesn't detract from the overall audio quality. The fit of those earcups makes a good seal to keep the majority of outside noise at bay, but if you want something that'll cut away all kinds of hiss then the Bose QuietComfort 35 might be a better (albeit less well made) option. 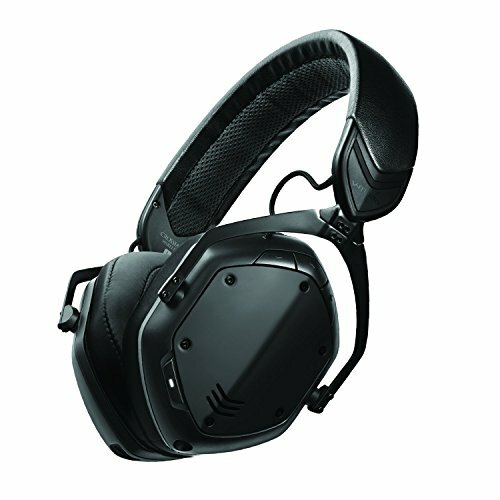 For round two V-Moda has knocked it out of the park with the Crossfade II Wireless. They're infinitely more comfortable than the originals, and while they still deliver strong bass the sound profile is better balanced, more accessible and even Hi-Res Audio certified (the lack of aptX HD is amiss, however). The industrial design may still be divisive, especially in certain colour finishes or metals, but we find the Crossfade II Wireless to be mighty impressive top-of-the-line over-ear cans. Move over Beats, if bass and top quality are on your hitlist then V-Moda is right on the money with the second-gen Crossfade. An obvious contender for bass-heavy balance, however the Beats simply aren't nearly as well-made as the V-Moda Crossfade Wireless 2. Leather and metal make for plush yet pricey BeoPlay cans. The H8 are one of our favourite ever headphones, however, and far better than the larger lower-down-the-range H7 model too. If you're angling the audiophile hook and less bass prominence then B&W might be more to your tastes. Also incredibly well-made and in a similar price ballpark.